Zimbabwe Cricket (ZC) has congratulated the women’s national team on their comprehensive 5-0 series victory over Namibia in the Namib Desert Women’s T20 Challenge played in Walvis Bay. “On behalf of the ZC board, management and staff, I send our warmest congratulations to every member of the Zimbabwe women’s national team – from captain Mary-Anne Musonda and coach Adam Chifo to every player and member of the technical staff – on your absolutely fantastic series victory over Namibia,” ZC acting managing director Givemore Makoni said in a message sent to the team. “It is a really outstanding achievement and we followed all the action with immense pride and excitement as you flew our Zimbabwe flag high,” he added. 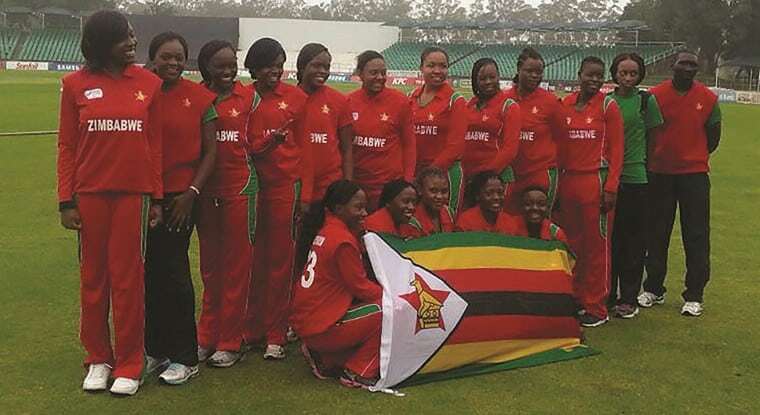 In the first match played last Saturday, Zimbabwe restricted their hosts to 96 for five in 20 overs, with Josephine Nkomo taking three wickets for 12 runs in her four overs, before the tourists replied with 98 for four in 18.1 overs for a six-wicket victory. Chipo Mugeri-Tiripano was voted player of the match for her unbeaten 40. The next day, Mugeri-Tiripano was given the player of the match award again after scoring 31 not-out to help the visitors to an eight-wicket win. With Musonda leading the side from the front in her first series as captain, Zimbabwe made 136 for eight in 20 overs, the skipper starring with 60 off her bat, before they restricted Namibia to 79 for nine to record a 57-run victory in the third match played on Monday. In their fourth meeting on Wednesday, the Chifo-coached side defeated their hosts by 69 runs, with Modester Mupachikwa scoring an unbeaten 75 and Musonda 45 not-out as they amassed 150 for two from 20 overs. Anesu Mushangwe took three wickets for nine runs while 16-year-old debutante Chiedza Mzembe grabbed two for 17. On Thursday, Zimbabwe completed the whitewash series victory with a nine-wicket win after they had skittled Namibia for 60 in 20 overs, thanks to Nomatter Mutasa’s four wickets for nine runs and Precious Marange’s three for five. They easily chased down the target in 9.3 overs, as Marange top-scored with 32 not out. ZC has pledged to give maximum support to the women’s team. “As we look to build on the success of the just-ended Namibia tour, we wish to assure you that ZC will continue doing all it can in support of your efforts to reach the highest level of the game,” Makoni said. The victorious team is expected to arrive back in Harare on Saturday night.